Jack is down for the count, locked in a pantry by his wife, who, moments earlier, was incapable of the slightest act of self-preservation. This is, surely, the protagonist’s low point: all hope is lost, there’s no way he’s ever going to get out of this pantry. For 30 years, the act structure of The Shining has eluded me — there are no clear, classic act breaks, there is no classic end-of-Act-II-low-point, there are no irreversible climaxes in obvious places, etc. This seeming lack of structure all stems from Kubrick’s choice of giving the movie an invisible protagonist: it’s hard to tell how the protagonist’s journey is going if you can’t see the protagonist. 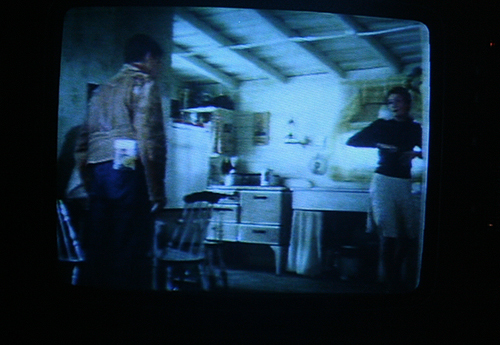 Monday morning, Wendy and Danny watch a movie on TV: Summer of ’42. Summer of ’42, for those unfamiliar with it, is a 1971 coming-of-age movie about a teenage kid who has an affair with an older woman whose husband is away at war. 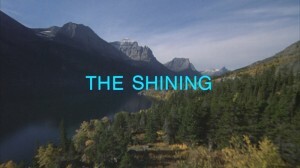 Some people read a lot of significance into the use of this movie in The Shining (some people read a lot of significance into absolutely everything in The Shining) — dwelling on things like Danny wearing a “42” on his shirt, or the fact that 42 is multiple of 12, as is 24, and there are 24 frames per second of film (I wish I was kidding) — but I see it more simply, and more dramatically. Summer of ’42 is a movie about a woman falling in love with a younger man while her husband is away. Now why would Wendy find that movie interesting at this point in her life? Obviously, because her husband has left her, even though they’re living in the same building and sleeping in the same bed, and all she has left is Danny. This is not to say that Wendy has carnal designs on Danny, only that Wendy’s whole life has been built around the romance of marriage and motherhood, and now the marriage part of that seems to be dead now. The Torrances have moved into the Overlook. A month has gone by without anyone getting murdered. Things seem to be going okay, all things considered. Wendy, who seems to enjoy being a wife and mother, acts like she’s playing house in an enormous home. Like Halloran says, “It’s still ain’t nothing but a kitchen.” Yes, you make your breakfast in the kitchen, then you wheel it on a cart past the Gold Room, into the hotel lobby, through God knows where, into an elevator, down the hall, up the stairs and into your bedroom — just like at home! 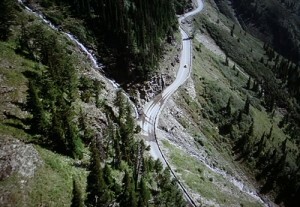 At the beginning of The Shining‘s second section, “Closing Day,” it’s almost like the movie begins again: here are more overhead shots of the yellow VW winding its way up an isolated mountain road. What’s different? Well, this time the car is going around the right side of the mountain instead of the left side. 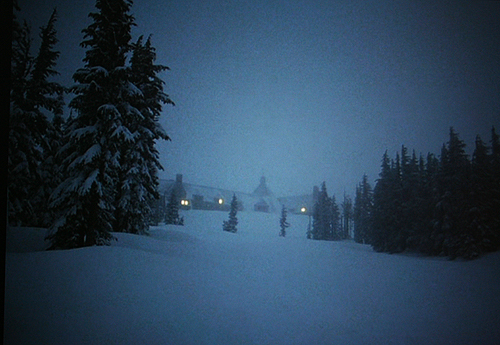 Much has been written, some of it quite intelligent, about the spatial anomalies and inconsistencies in The Shining: there are rooms with windows that should not be there and doors that couldn’t possibly lead to anywhere, rooms appear to be in one place in one scene and another place in another, wall fixtures and furniture pieces appear and disappear from scene to scene, props move from one room to another, and the layout of the Overlook makes no physical sense. 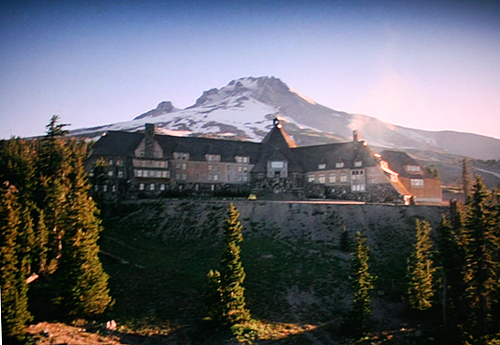 To name only obvious example, the establishing shots of the hotel, which is a real hotel in Oregon, show no gigantic hedge maze off to one side. For myself, I have a rule — if the filmmakers don’t point at it, I’m not supposed to notice it. 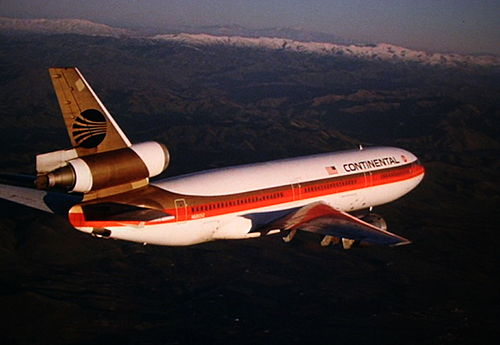 I think that, beyond presenting a vague sense of disorientation, all the inconsistencies and conundrums are simple continuity problems. Kubrick shot and assembled the movie over a period of months and the production design was meant to serve each scene as a separate entity, he wasn’t worrying about whether the architectural details would all line up. 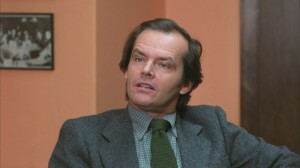 For instance, when Jack enters Room 237, the room bends away to the left. But in the hallway outside, there are doorways to other rooms where the bedroom and bathroom of Room 237 should be. I don’t think this is a deliberate mystery, I think Kubrick wanted the room to look one way and the hallway to look another way, and didn’t worry about whether the two set designs matched up. In the case of the road now being on the other side of the mountain, my guess is that Kubrick shot the scene in the car, which features Jack in the foreground, the camera placement necessitated mountain vistas being visible in the background process plate, which necessitated establishing shots of the car going up the right side of the mountain. And yet, the “Closing Day” section is designed to one overwhelming purpose: to establish The Overlook as a character in and of itself. Because, as I’ve mentioned earlier, the hotel is the protagonist of the narrative. The Shining opens with a series of glorious shots of a yellow VW bug driving up a mountain road. The mountains are large, the VW is small. 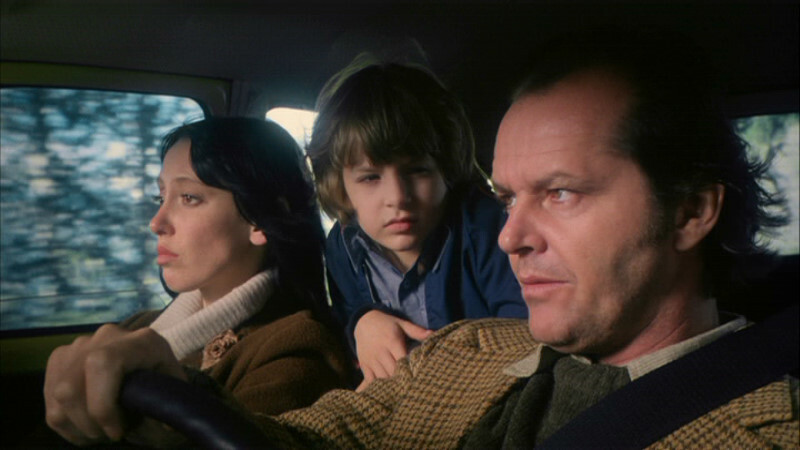 The car, we will soon learn, belongs to Jack Torrance, who’s driving up to the Overlook to interview for the chopping up his family caretaker job. Why doesn’t the movie open with a scene of Jack, in the car, listening to the radio as he winds his way up the road? Halloran gets shots like that later, while he’s driving his snow-cat up those same roads through the snow. The difference between Jack driving up in the fall and Halloran driving up in the winter is: Kubrick wants us to identify with Halloran, and he wants Jack to get lost in the landscape. The landscape overwhelms the yellow VW, even swallows it up at one point as he drives through a tunnel. Because the VW is the first relatable thing we see in the movie, the viewer identifies with it and shares its sense of being a tiny thing in a vast, forbidding landscape. The Shining, when it came out in 1980, was roundly derided by critics and fans of the novel, to say nothing of the novelist, for being criminally, bone-headedly wrong. Why were people so upset? Some were upset because of Jack Nicholson’s performance, which took the character from the novel and blew it up into a drooling, wild-eyed crazy man. Some people were upset because of the radical changes in the plot. Some were upset because they felt the movie didn’t take its subject matter seriously enough. Some were upset because they felt the movie was too “cold,” without emotion or heart. I think the real reason people were upset was because they had trouble identifying the protagonist. Who is the protagonist of The Shining? Let’s go down the list.